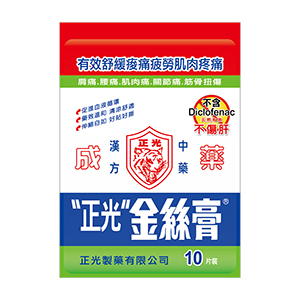 Medicated Plaster (Cool)|Cheng Kuang|Pain Relief Patches ; Sprays for Powerful Pain Relief When and Where You Need It. Our Medicated pain patch is made from selected natural herbs using modern biotechnology and this pain patch is a flexible non-steroid and anti-inflammatory adhesive pain patch. Our Medicated pain patch is rich with genuine Chinese herbs and made from carefully selected, rare and precious Chinese herbs. Specific properties of individual herbs and their overall coordinated effect has a beneficial effect on the muscles and joints. Cheng Kuang Medicated Pain Patch is highly recommended patient-friendly product and be able to make you and your family feel more comfortable each and every day. 1.Our pain relief patches are suitable for minor injuries from falls, fractures, bruises and strains. 2.Our pain relief patches are also for pains in the hands, feet, shoulders, and back. 1. First, clean the affected part and keep dry. Then apply the plaster to the affected part. 2. Repeat once or twice a day. The effects will last for 6-8 hours for each application. 3. Use the patch after a warm bath or shower; it will improve the effectiveness of the patch, since it increases the transmittance of the skin. 4. When using the patch on small joints(fingers), you can cut it into narrow stripes. 5. Store unused patches back in a sealed bag. 1. Do not apply the patch to the eyes, mucus membranes, and skin with eczema and rashes. 2. Stop using immediately if you find symptoms such as a rash or itching after using this product. 3. Consult your doctor or pharmacist for instructions if you are allergic to drugs or makeup before using this product. 4. Keep out of reach of children. Children must not use without the parent’s or guardian’s permission or knowledge. 5. This product should be screened from direct sunlight. Copyright © 2017 Cheng Kuang Pharmaceutical Co., Ltd. All rights reserved.